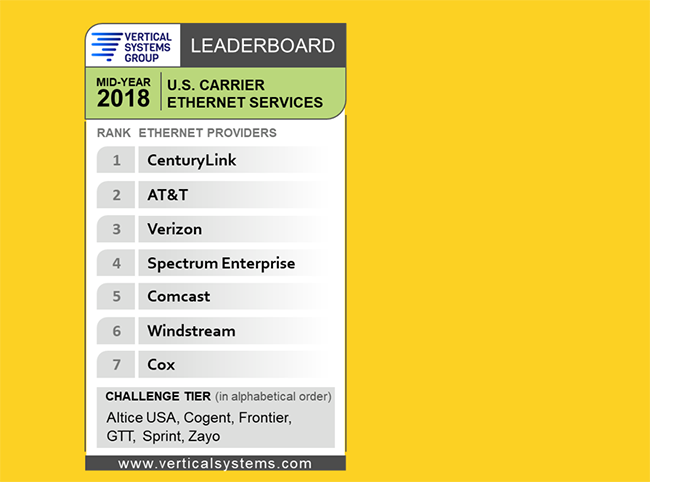 Vertical Systems Group released its Mid-year 2018 U.S. Carrier Ethernet LEADERBOARD listing the top seven carriers, in rank order based on retail port share, as follows: CenturyLink, AT&T, Verizon, Spectrum Enterprise, Comcast, Windstream and Cox. 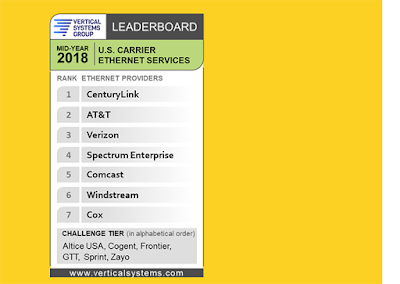 To qualify for the LEADERBOARD, providers must have four percent (4%) or more of the U.S. Ethernet services market. Shares are measured by the number of customer ports in service as tracked by Vertical Systems Group, with input from surveys of Ethernet providers. 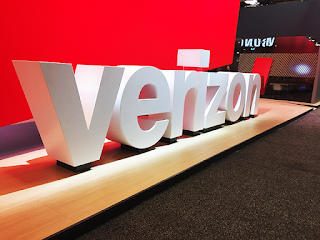 "After a flurry of M&A activity during the past two years, the Ethernet marketplace stabilized during the first half of 2018," said Rick Malone, principal of Vertical Systems Group. "U.S. port growth was more than 6 percent for the period, with accelerating deployments of multi-gigabit speed services. Most providers experienced acute price compression across all data rates, partially offsetting the revenue typically generated from higher speed services. All providers are grappling with longer sales cycles due to SD-WAN, however the impact on the U.S. Ethernet base has been negligible to date." Other providers selling Ethernet services in the U.S. are segmented into two tiers as measured by port share. The first or Challenge Tier includes providers with between 1% and 4% share of the U.S. retail Ethernet market. For Mid-Year 2018, the following companies attained a position in the Challenge Tier (in alphabetical order): Altice USA, Cogent, Frontier, GTT, Sprint and Zayo. As a result of the ZTE ban, revenue from China declined 13 percent year-over-year. “The optical transport network equipment market year-over-year decline in 2Q18 was entirely due to fewer sales into China,” said Jimmy Yu, Vice President at Dell’Oro Group. “Demand outside of China continued to improve, which is a great sign for the overall market health. Now that the ZTE ban has been lifted, we think optical revenue from China will increase substantially in the second half of the year,” added Yu. Huawei held the highest Optical Transport market share in the quarter followed by Ciena and Nokia. Demand for interconnecting data centers (DCI) with WDM links maintained a high growth rate. We estimate DCI grew nearly 40 percent year-over-year, driven by both U.S. and Chinese based internet content providers. Deployment of 200 Gbps coherent wavelengths was exceptionally strong in the quarter. Due to the tidal shift towards wavelength speeds higher than 100 Gbps, we predict 200 Gbps shipments will be two-times higher in 2018, and revenue contribution from 100 Gbps shipments will slow further. Dell’Oro Group is predicting that the sales of Software Defined Wide Area Network (SD-WAN) technologies will grow at a compounded annual growth rate of 35 percent over the next five years. A new Dell'Oro report forecasts the sales of SD-WAN software to grow at almost double the rate of hardware. “The SD-WAN software components are the key differentiators of vendors’ offerings, and we expect controller and virtualized network functions software revenue to account for the large majority of the market size,” said Shin Umeda, Vice President at Dell’Oro Group. “Over time, software innovation will drive the SD-WAN market while hardware will increasingly be commoditized,” added Umeda. Dell’Oro Group’s Advanced Research: SD-WAN Report forecast is based on a bottoms-up methodology and includes details of the hardware and software components required for full SD-WAN implementation separated into enterprise and telecom market segments. This new advanced research report also forecasts the SD-WAN market by the type of customer deployments. Sales of SD-WAN solutions to Enterprises will account for the largest portion of the market over the next five years. Service Provider SD-WAN deployments for the purposes of managed services will grow at an average annual rate over 40 percent over the next five years. Worldwide NVFI revenues were just $564 million in 2017 but will grow at a compound annual growth rate of 58.1% over the 2017-2022 forecast period, reaching $5.6 billion in 2022, according to a new study from IDC. In defining NFVI, IDC relies on ETSI's proposed architecture to identify five segments: software-defined compute, networking, storage, management, and orchestration. IDC expects the orchestration segment will be the fastest growing, driven by the need to orchestrate network services dynamically across an increasingly complex smorgasbord of network functions – both physical and virtual – potentially across several vertical domains. Software-defined networking is also likely to grow significantly, driven by the growing need to programmatically manage network flows in response to a dynamic market and an application/use case environment – both within the telco cloud datacenter and across telco cloud deployments to manage services flows. From a domain perspective, wireless infrastructure is the largest contributor to the NFVI forecast today and will continue to be the largest contributor throughout the forecast, followed by routing. 5G will be a big driver of wireless infrastructure NFVI growth, while the move to virtual routing in edge and access use cases will enable routing NFVI growth to outperform the overall market. "Communications service providers globally recognize the need to digitally transform their network infrastructure and build more customer-centric business models. Embracing software-defined networking principles and deploying network functions in virtualized form factors are a strategic necessity not only for carriers as they invest in their future but also for vendors supplying those solutions to the market," said Rajesh Ghai, research director, Carrier Network Infrastructure research at IDC. "NFVI is the foundation on which this vision rests and this forecast is IDC's first effort to size this strategically important segment of carrier network infrastructure." Alibaba's Cloud Computing division recorded revenue of RMB 4,698 billion (US$710 million) for Q2 2018, up 93% over the same period last year. EBITA was RMB (488) million, reflecting a margin of -10% for the division. Overall, the Alibaba Group achieved quarterly revenue of RMB 80,920 million (US$12,229 million), an increase of 61% year-over-year. Revenue from digital media and entertainment increased 46% year-over-year to RMB5,975 million (US$903 million). Annual active consumers on China retail marketplaces reached 576 million, an increase of 24 million from the 12-month period ended March 31, 2018. Mobile MAUs on our China retail marketplaces reached 634 million in June 2018, an increase of 17 million over March 2018. “We delivered another great quarter with 61% revenue growth as well as strong profit growth, excluding one-time items. We are pleased with the strength and rapid growth of our business at such significant scale,” said Maggie Wu, Chief Financial Officer of Alibaba Group. “The exceptional growth across our major segments of core commerce, cloud computing and digital media and entertainment validates our strategy of investing in customer experience, product, technology and infrastructure for the future." The CBRS Alliance, an industry organization focused on driving the development, commercialization, and adoption of "OnGo" shared spectrum solutions, now has over 100 member organizations. The CBRS Alliance, which is now two years old, two-year anniversary, also announced the establishment of its Deployment and Operations (D&O) Working Group (WG), to be chaired by Piyush Raj, Director Technology Innovation, American Tower – the largest U.S. owner and operator of wireless communications infrastructure – and Boingo Wireless Chief Technology Officer Dr. Derek Peterson. The fifth working group of the CBRS Alliance will be focused on identifying, defining and implementing end-to-end deployment models and operational best practices for OnGo connectivity, including the interconnections between networks, network operators, and roaming hubs. The Federal Communications Commission (FCC) will be certifying CBSDs against CFR 47 Part 96 using FCC Authorized Test Labs. Accordingly, the WInnForum is facilitating CBSD certification testing, against this test specification by approving FCC approved test labs to run the WInnForum CBSD tests. Science Applications International Corp. (SAIC) will relocate one of its two data centers to a CyrusOne data center in Northern Virginia by the first half of 2019. CyrusOne broke ground on a 654,000 square foot data center in Sterling, Virginia -- its fifth data center in the Northern Virginia market. 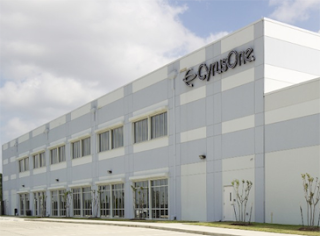 CyrusOne said its new data center will have direct access to one of the largest fiber hubs in the United States as well as offer interconnectivity to the CyrusOne National Internet Exchange (IX) to reach other CyrusOne locations across the country. 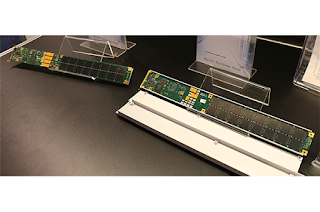 LITE-ON Storage is developing a "ruler style" EDSFF 1U solid-state drive (SSD) in conjunction with CNEX Labs. The design aligns to Open Compute Project (OCP) specifications and delivers storage density, system design flexibility, thermal efficiency, scalable performance and easy maintenance with front-load hot swap capabilities. The hardware design also supports low-latency, 3D TLC and low-cost QLC NAND flash-based depending on end-users’ specific cloud applications. No timetable for the new SSD’s release was announced.